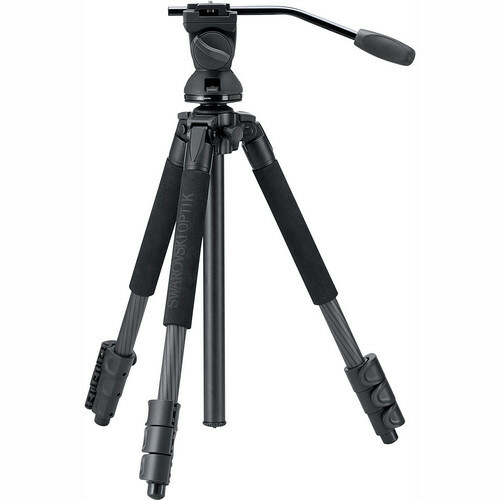 Do you need a compact travel tripod that can also provide you with the equipment support you need out in the field? The Swarovski Optik Travel CT Travel Tripod is the perfect lightweight tripod (3.1 lb, 1.4 kg) solution that can easily be carried in your luggage or gear bag, since it folds down to only 19.7" (50 cm). Designed for frequent and intensive use usually required for outdoor sporting, it comes with the DH 101 Tripod Head which together provide secure and stable support for your spotting scope, digiscope, or rifle scope. The CT Travel and DH 101 reach a working height of 71.6" (181.9 cm) and will provide you with a stable base for your equipment even under extreme weather conditions. The carbon fiber tripod CT 101 is not only extremely rugged, but with the DH 101 Tripod Head attached it also offers a viewing height of 71.7" (181.9 cm) and weighs just 4.5 lb (2.1 kg).